I also happen to be one of those people who, when completed a task, likes the mess to go away on its own – I’m done with it. I don’t want to look at crusty baking sheets and flour-spattered counters for more than five minutes after the cookies come out of the oven – but I also really, really hate doing dishes. In my fantasy world, this is where I’d be saying something cheeky like “This is where my boyfriend comes in,” and I don’t blame you for jumping to that conclusion yourself (unless of course, you know TJ…). So instead of using this space to praise my thoughtful boyfriend, who always rewards my baking and cooking by offering to do the dishes, I’m going to take this time to complain about the fact that somehow, mine seemed to have skipped that gene that everyone else’s boyfriend seems to have – that gene that makes men know that in the end, they’re far better off if they just break down and wash the dishes. Watching TJ do the dishes (on those rare, fleeting occasions) is a painful, agonizing process. First comes the nag from me: I turn on my sweetest possible voice, bat my eyelashes a few times in his general direction, and ponder, ever so slightly, if he would mind doing the dishes. Then comes the grunt of acknowledgement from his side of the room. This is when I start to get grumpy. I probe him again, a deeper, darker inflection to my voice as I ask him again, if he could do the dishes. It continues like this until either a) I get really angry and start doing them myself, or b) he gets the hint and finally walks over to the sink, washes a dish or two, then gets bored and goes back to whatever foolish thing he was doing before, leaving me to either a) nag him again, or b) do them myself. So you can see why a recipe called Frying Pan Cookies caught my eye when I was sifting through a pile of my grandmother’s old recipe cards a couple of weeks back. Cookies you can make in one simple skillet? I was hooked. I’ll be the first to admit that the cooking method is not the only unconventional thing about these cookies. They’re not really cookies at all, actually, more like sweet little balls of sugar, Rice Krispies and chewy chunks of dried fruit. But they’re fun to make, yummy to eat and, most important, all you need is one glorious, easy-to-clean skillet. In a large frying pan, add 2 eggs and 1 cup sugar. Mix until well combined. 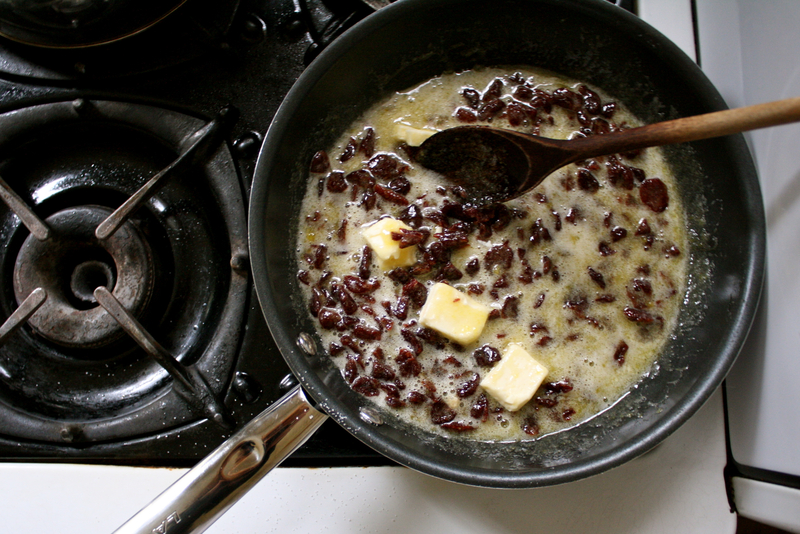 Stir in dried fruit, butter and salt. 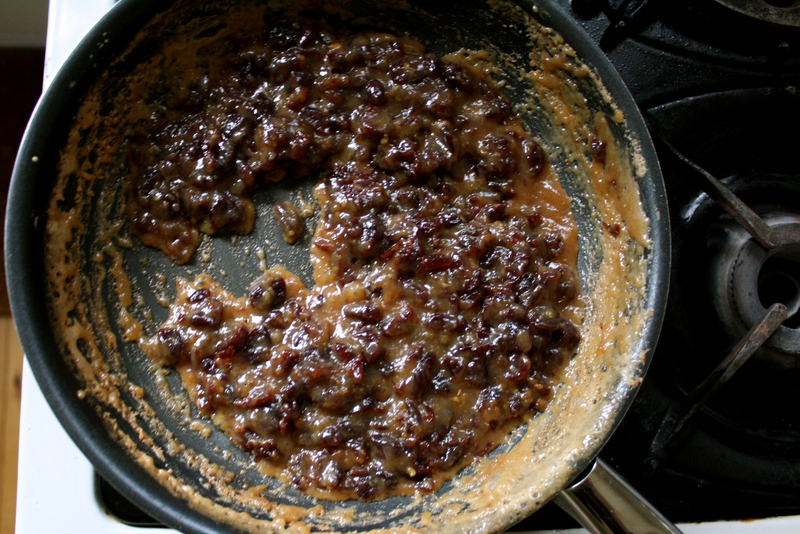 Place on low heat and cook, stirring occasionally, for 20 minutes, until mixture thickens. Remove from heat and stir in vanilla and Rice Krispies. Let cool slightly. Spread coconut out on a large cutting board. 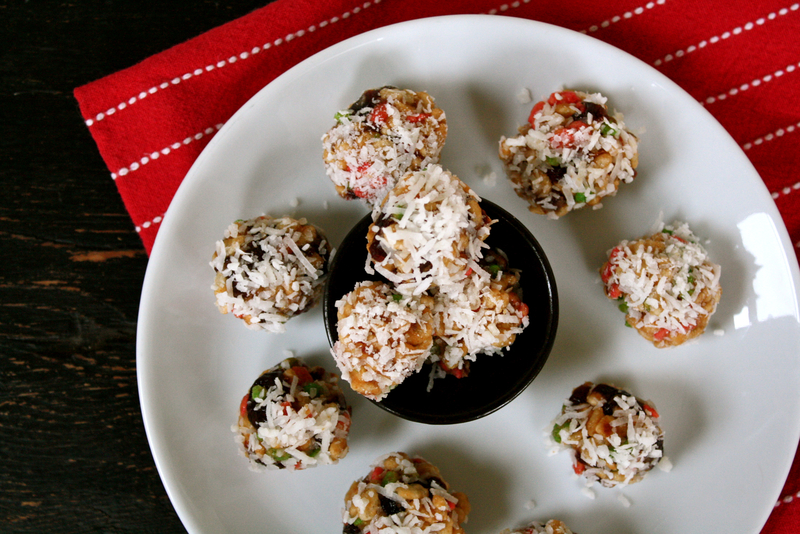 Form Rice Krispie mixture into 1-inch balls and roll in coconut. Tip: If you have trouble getting the cookies to bind, sprinkle just a few drops of water onto cookies and roll into balls with damp hands.